Rather than pay expensive health club or gym fees more and more people are buying home gym equipment than ever before. Equipment you can use at home is becoming more sophisticated, and there is a wide range available at varying prices, so it's important to buy one that suits your needs. 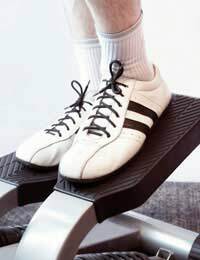 Having your own gym equipment at home is a lot more convenient, it means that you can train when you want and for the length of time you want. If you are looking to buy home gym equipment there are some things you should look out for before you buy to make your training at home safe. Test the machine before you buy it. Make sure it's suitable to use. Some people buy equipment that doesn't fit them. Make sure the equipment is the right length and not too narrow. Buy one that has an adjustable seat or settings. Shake the equipment to make sure it doesn't wobble, or move easily. Find machinery that has heavy gauge steel tubing. This eliminates flexing and improves the quality of movement. If you are buying a weight stack machine, be aware open stack types can pose a threat of crushing hands. Buy a shroud for any open stack machines, if it doesn't already have one. If a shroud isn't available for your model and you have children, think about buying a different type. Check the cables are strong enough to lift heavy weights without snapping. Check the machine has a smooth action and doesn't make a noise when used. Buy a model that has covered cables, they help prolong the life of the cables. Keep children away from equipment. Once you have your equipment set up at home, you should remember it needs to be used safely. Check there are no loose screws or fittings and that the machine is stable and on a level surface before using. Here are some tips to get the best out of your home gym without suffering any injury. Don't over train. Overtraining and overuse of muscles is the major cause of injury for anyone using home gym equipment. Limit work sets. At any training session limit yourself to no more than 30 all out work sets. Never train for more than two days in a row. Your body needs time to rest. If you are trying to build muscle it's important to do this, as overtraining is counterproductive to building muscle. Take a week off from training after four two six weeks, or at least reduce your training regime considerably. It's normal that you get some muscle soreness 24-48 hours after exercising. This is known as DOMS (delayed onset muscle soreness). This is especially common if you have just started an exercise regime. If a pain persists rest it for a few days. Continuing to train may cause more damage especially if you are suffering from a slight strain. If the pain recurs when you resume training consult a doctor, as it would be likely you have damaged a muscle. Having home gym equipment is about getting fit, so try and stay injury free. Always rest for appropriate periods and remember don't overdo it.